JoAnne and Gregg Schnepp, A Touch of Camo owners, have nearly 40 years’ experience in the wedding industry. In 2017, JoAnne and Gregg’s daughter, Michelle, and her family also joined the ATOC team. Gregg opened Gregg Schnepp Photography in 1980, specializing in wedding photography and JoAnne worked as his assistant. In 1987, Michelle began photographing weddings while working in a bridal shop. In 1996, JoAnne decided she wanted to expand into the bridal business, and opened White Lace and Promises, an online store specializing in helping brides design their own custom-made traditional wedding gowns and accessories. 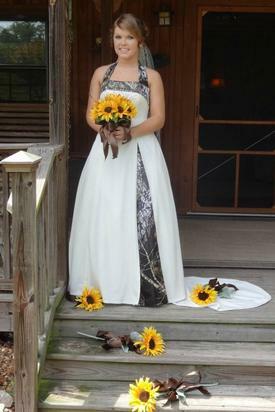 In 2007, a bride named Heather, who had already purchased her wedding dress, was hoping she could find someone who could add a camo pattern to the front panel. Heather was having a country and western, rustic-themed wedding and wanted something special. When Heather approached A Touch of Camo with her request, we researched and found the camo-printed, bridal satin oshe wanted, and our seamstress made Heather her dream dress! We featured this dress, named Heather, on our website, and the orders for camo-accented formalwear started flying in! The business was re-named A Touch of Camo and we focused on creating custom-made, camo-accented gowns for brides, bridesmaids, and mother of the bride; as well as men’s vests, ties, and cummerbunds; and children’s items, to complete the look of a camo-themed wedding or formal event. A Touch of Camo is currently the only small business in the United States offering custom embroidery and hand-beading on our camouflage wedding and prom dresses, along with every dress having built-up bodices with boning, attached crinolines, and being fully lined for comfort. Our dresses are comparable to any well-known dress designer in both their quality and workmanship. We use only one seamstresses and the factory for sewing, which provides an individualized and personalized touch to your dress, as each dress is custom made when it is ordered. Each of our current dress styles were designed by and named for the customer who ordered them. If you would like to design your own custom dress we would be happy to help you achieve your perfect look, and add your creation to our gallery!